Former Schalke legend, very versatile player capable of playing on various positions but mainly played as inside right. Fantastic playmaker and even scorer with 234 goals in 342 games for Schalke. Fritz was relativly slow player but had fast thinking, brillant positioning, intelligence and tactical awareness, had fantastic technique and good anticipating , excellent vision with ability to break the opponents defence with a single touch and lethal pass. He was very good in defensive duties, especially in NT where he played much deeper. Szepan father was from East Prussia (district Neidenburg) into the industrial Ruhrgebiet emigrated to find work in mining. In a typical working-class milieu of "coal-mining" the young Fritz grew up as one of six children in the family. The yellow-haired boy was playing football in street teams in the neighborhood. After his discharge from school without completing an apprenticeship as a plumber Szepan completed and made way for a successful performance of the apprentice selection of his operation. At the urging of his friend Ernst Kuzorra Szepan joined in 1925 as a 18-year-old on the first team squad of FC Schalke 04 Kuzorra married sister Eliza was also Szepan, thus his brother and together they formed the most "famous brother-in pair of football history. "After Kuzorra Szepan and had established itself in the first team of Schalke, has developed this into one of Germany's best club teams. 1934 Schalke won for the first time the German Championship with a 2-1 victory over the first FC Nuremberg in the final, where in the 88th Szepan Minutes was made and the balance Kuzorra concerned the winning goal. Thanks to the completion celebrated in "gyro", the art of centimeter-accurate, fast flat passing game, the free running and dribbling, the team ran in the royal blue jersey in the following years of success to success. In 1935 the title was successfully defended with a 6-4 over VfB Stuttgart. Two years later won the "Royal Blues" with mastery and Tschammerpokal. the first double of the German football history. By 1942, the Schalke were four more times in the finals for the championship and won 1939, 1940 and 1942. Schalke 04 dominated in this period, the German football and laid the foundation stone for the "Myth of Schalke." The 1942 championship was the last championship for Schalke 04 in the Second World War and also the last title for 16 long years. After the war, helped the "blonde Fritz" in the reconstruction of the FC Schalke before he quit in 1949 because of knee problems and back pain, the football boots on the nail. On 12 November 1950, together with his brother-Szepan Kuzorra with a match against Atletico Mineiro in the Schalke Glückaufkampfbahn officially farewell. 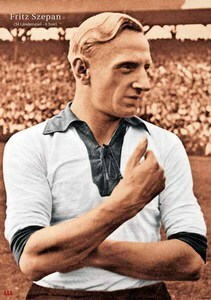 For ten years, from 1929 1939, Szepan played for the German national team and scored eight goals in 34 games. 30 times while he was wearing the captain's armband. His international debut on 20 Szepan October 1929 game against Finland. In a 4-0 victory was immediately a hit, but a starting place could not win the 21-year-Nocht. It was not until 1934, he was permanently in the root formation and was appointed shortly before the World Cup as captain. At the first World Cup finals in Germany in 1934 in Italy, Szepan led his team to the semifinals where they lost but Czechoslovakia. At the end the team finished a 3-2 victory over neighboring Austria the third place. On 16 May 1937 Szepan was captain of the so-called "Breslau-Elf", which had defeated Denmark 8-0 (one goal by Szepan) and went down in German football history. After this victory, Germany was seen as dark horses for the 1938 World Cup in France. But after the "Anschluss" of Austria just before the tournament, had to make a "great German" Elf. But the game systems of the Germans and Austrians not matched one another, so you already retired in the second round of the World Cup. On 22 October 1939 in a 2-1 victory over Bulgaria Szepan took his leave from the national team. After the war, helped with the reconstruction of Szepan Schalke team. After ending his playing career in 1949 he took over as coach at the "Royal Blues." This office he held until 1954, before he led with Rot-Weiss Essen another area club for the German championship. Moreover Szepan was at TSV Marl-Hüls trainers. 1963 could be Szepan to persuade the new president of FC Schalke to become what he remained for four years. Then he retired into private life. Fritz Szepan died in 1974.